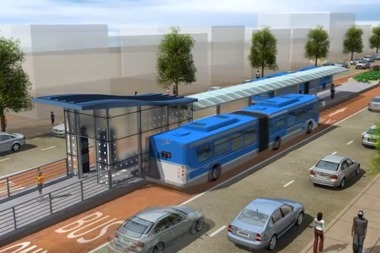 The Bus Rapid Transit system proposed for Ashland Avenue would mean fewer parking spots on the street and fewer left turns, but improve travel times for bus passengers, opponents and supporters have claimed. BRIDGEPORT — A plan to transform a 16-mile stretch of Ashland Avenue from Irving Park Road to 95th Street into a "Bus Rapid Transit" system would be a huge change for neighborhoods within the 11th Ward — but candidates running for office there refuse to say where they stand on it. The Active Transportation Alliance, a grassroots bicycling organization, is pushing voters to show their support for the plan to the three candidates running to replace retiring 11th Ward Ald. James Balcer: Patrick Daley Thompson, Maureen Sullivan and John Kozlar. Opposed to the BRT is Charles Paidock, an 11th Ward resident affiliated with Citizens Taking Action, an advocacy group on CTA issues. Paidock is rallying voters against the project. A Bus Rapid Transit system on Ashland Avenue would improve travel times and boost the reliability of public transportation, supporters say. The transportation alliance made it clear that, as a nonprofit, it can't formally take sides in the race. "We don’t endorse candidates," said alliance executive director Ron Burke, "but we do educate them about ways to create better transportation options, and we encourage residents to do the same." Designed to improve travel times and boost the reliability of public transportation, the estimated $160 million project would put boarding stations and dedicated buses in the center lanes of Ashland Avenue between Irving Park Road and 95th Street. Critics have complained the plan would mean less parking and bans on left turns, and possibly, more auto traffic in residential areas. Burke said "the city badly needs a rapid transit line on the West Side that connects the spokes in CTA's hub-and-spoke system." "This is about a transit system that is often inaccessible and so slow that students can't count on getting to school on time, unemployed Chicagoans can't get to where the jobs are, and businesses avoid locating in Chicago because the transit system is insufficient," Burke said. "These citywide needs far outweigh the modest inconvenience of limiting left-hand turns from Ashland." Paidock disagrees, however, and said the CTA is better off allocating resources to basic service, such as 24-hour bus routes and train service. "The Orange Line cuts out early. We used to have two buses that went into the Loop, providing a one-seat commute. Now we have to transfer, and pay to do it," Paidock said. A local neighborhood association was working to get the 31st Street bus restored, without success, he added. "Our priorities seem to be a little bit different than" the alliance's, Paidock said. Paidock is sending voters to a local group opposing the bus plan. Alliance campaign director Kyle Whitehead responded to Paidock directly in an email Wednesday, saying, "Rapid transit on Ashland is just one of the many transit improvements we support, such as those you refer to in your message. "We recognize none of these improvements are likely to happen without increased funding, which is why we've partnered with [the Center for Neighborhood Technology] on the Transit Future campaign at the county level," Whitehead said. "We’re also part of a coalition of advocates calling for increased funding for transit at the state level in any potential capital bill this spring. "Together we hope to demonstrate the need for increased transit investment to local leaders at all levels of government," Whitehead added. The candidates can get caught in the middle, especially given how the most recent remap moved Ashland from a central position to the edge of the ward. Despite the strong position by both advocates on each side of the issue, none of the three candidates would take a position on the express bus when contacted by DNAinfo Chicago. "Due to ward remapping, at this time Maureen has no position regarding the Ashland BRT proposal," Sullivan spokesman Rob Warmowski said. "She is in favor of improved CTA service along Ashland. "The remapping of her 11th Ward away from its past prominence on both sides of Ashland under the old map means she has not as yet had a chance to attend a formal presentation on the BRT proposal," Warmowski added. "As regards to her transit policy, Maureen has been strongly in favor and visibly active in lobbying for a return of CTA's 31st Street bus service." Warmowski promised "a fair and detailed look at the Ashland BRT proposal will closely follow her election to alderman." Thompson campaign spokesman David Bayless echoed that, saying, "If elected, Commissioner Thompson will perform a thorough review of mass-transit issues that impact residents and business." Yet for now he "needs to gather more information and data and listen to his constituents to gain a full understanding of how the Ashland BRT will affect commuter and commercial traffic patterns, overall usership and the retail environment on Ashland." 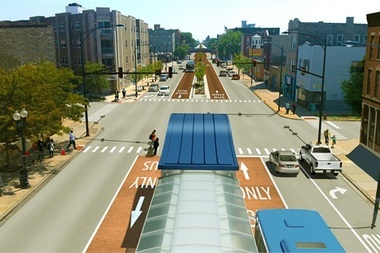 Kozlar said Thursday that ward residents are divided on the Ashland BRT, and he's hearing from both sides, which makes it all the more important for the next alderman to listen to voters and consider how to proceed. "For me it's just the message remains the same," Kozlar added. "You have to sit down and talk with the residents to come up with the best solution and just have open communication. "You can tell it's a major concern," Kozlar said. "Kind of like the heliport, I don't want to just shove this down through a back door deal without addressing the issue with our community as a whole." CTA spokesman Brian Steele said the agency is reviewing public feedback from last summer "and considering options and potential modifications, including the implementation of additional left turns." "We are also continuing to explore options for funding for the next phase of design. Currently, there is no specific timetable set for that to begin,” Steele said.